‘Your system doesn’t support this video file pop-up’ is a misleading warning which you may discover as a banner advertisement or which may pop-up after trying to load some video online. In most cases computer users face this pop-up when trying to stream videos found on sites which do not have the best reputation. Of course, you may discover the suspicious pop-up on any website in case adware has been infiltrated onto the system and various suspicious and potentially unreliable advertisements are now flooding your Google Chrome, Mozilla Firefox or Internet Explorer browsers. Please continue reading to find out what it means to remove Your system doesn’t support this video file pop-up related software. 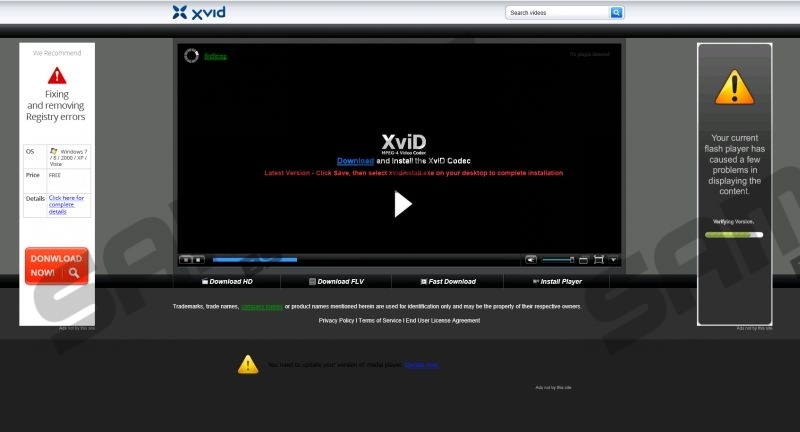 Even though ‘Your system doesn’t support this video file pop-up’ often suggests the installation of authentic software, including the VLC player or other well known media players, you need to be extra cautious. If you are recommended to have some player installed on your personal computer, you should install it from its official website not via some suspicious online advertisement. In fact, if you choose to install software related to the pop-up, there is a great chance that your personal computer will become flooded with adware, unreliable browser plugins and potentially undesirable programs (PUP). Unfortunately, some of the bundled applications could have no interfaces and could be extremely difficult to spot and then delete. If after you install Your system doesn’t support this video file pop-up related applications onto your personal computer you discover suspicious pop-ups, banner offers and the activity of unfamiliar programs, you need to inspect your operating system as soon as possible. Even though in some cases your personal computer could be clear of critically malicious infections, in other cases dangerous malware could run without you even realizing it. Do you know how to inspect your personal computer? We offer you to download the free-of-charge and reliable SpyHunter’s scanner. This tool will examine your operating system and will identify all malicious threats, adware or potentially undesirable programs. It is a must to remove Your system doesn’t support this video file pop-up related software from the PC if you have discovered it running on the operating system. As our researchers have discovered, the misleading pop-up may hide adware and other undesirable programs. Use the manual removal guides below to delete less clandestine, undesirable applications and install automatic malware detection and removal software to delete more vicious and dangerous threats. Click the Start icon on the Task Bar. This will open a menu. Go to Change or Remove Programs and Remove the undesirable software. Navigate to the Task Bar and click Start to open a menu. Right-click the application(s) you wish to delete and select Uninstall. Now right-click on the background, select All apps and open the Control Panel. Quick & tested solution for Your system doesn’t support this video file pop-up removal.